When siblings like Ernest and Tiffany Chan exude a love of the arts and a strong commitment to giving back to the community, you can bet that it was no accident. Raised in Austin, these siblings have clearly been encouraged to develop their creative muscles, both having created bras for Art Bra in 2014. And, defying the stereotype of sibling rivalry, Ernest says that his older sister, Tiffany, has been a “constant inspiration for my art and an ever-present base of support.” Well done, Chans — BCRC is grateful to be the recipients of your considerable talent! Currently a senior at Anderson High School and a performing member of the Troopers Drum & Bugle Corps, Ernest’s passions lie in music and art, and he plans to continue his studies at the University of Texas at Austin pursuing a major in Advertising. 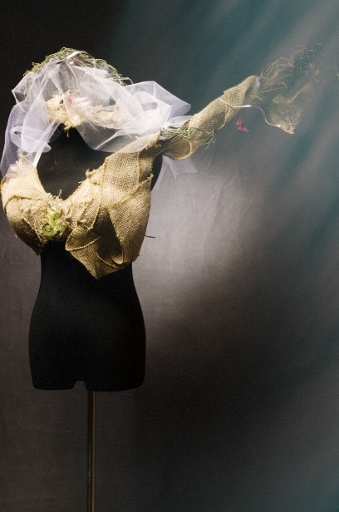 Ernest was inspired by the way nature and industry are becoming increasingly unified, so he created a bra using burlap, metal ribbon, wire ribbon, faux birds and butterflies, tulle and fabricated wood branches. By using both manufactured and natural materials, Ernest says he “sought to find a beauty in the marriage of these two unlike ideas.” It’s clear he succeeded. Currently a third-year undergraduate student at The University of Texas at Austin, Tiffany is pursuing a Bachelor of Science in Textiles & Apparel Design and a Bachelor of Arts through Plan II Honors. Describing her artistic style as detail-oriented, feminine, and whimsical, Tiffany sought to create a bra that was reminiscent of the “It” Girl of the Roaring 20’s, capturing the extravagance and elegance of a Gatsby party. She used very feminine materials such as beaded lace trim, cream ruffled trim, white fringe trim, a strand of crystal rhinestones, additional clear crystals, white feathers, and a broach to create her bra, which comes with a feather and pearl embellished wrap. We think it’s the bee’s knees!